Back once more in Phnom Penh. Some things change, and some things don’t. The city seems more vibrant, and the political situation seems less troubled. But the streets still need repair, and the “Police Blotter” in the Phnom Penh Post is always full – with tales of violence which often churn the stomach. Still, we never feel anything other than at home here. People always smile, and progress is in the air. The streets are busy, and the markets full. And, as this time it was coming up to the New Year, a festival spirit was in the air.The National Museum was very busy, and its sun filled open courtyard makes a pleasant spot to while away a few minutes, pondering the Khmer Empire and its wonders. It seemed that the whole town was full of saffron robed monks, often young men (boys?) with a can of coke in one hand and a rosary in the other. The Palace was as impressive as ever, and the street vendors hustled outside, but always with good humour. People enjoying the holiday season were sitting happily along the Tonle Sap river bank, with kids swimming in the cool waters. On this trip, Ingrid and I were accompanied by Dave and his girlfriend Eugene, Michala, Victoria and Daniel. It was Eugene’s first visit, although the others are all Cambodian veterans. So it was time to show them Tuol Sleng, the Genocide Museum. Dave had been before, but the others had not, and we felt they all knew enough about the history of the Country, and were ready to see what really happened. I will not repeat the detailed story of Tuol Sleng (S-21) here, except to say that of the estimated 14,000 to 17,000 prisoners, only 12 are believed to have left alive, and only 7 have come forward. And also to note that the “boss” of Tuol Sleng (“Duch”) is now in Jail but yet to face trial – whilst many other longtime and senior KR leaders continue to deny knowledge of what went on there. 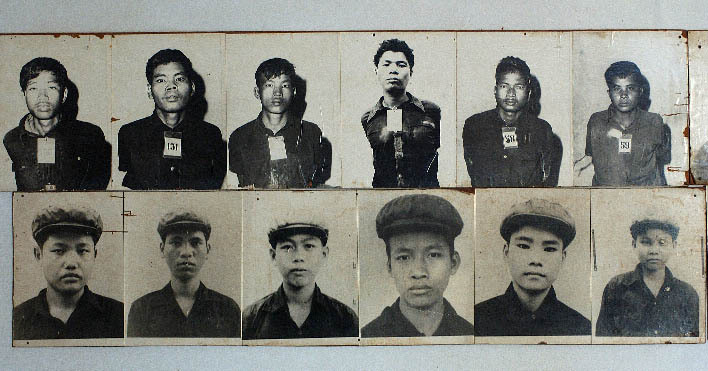 This website is not about politics, although it does seem to us that the Government has done a good job of reconciliation with the ex-Khmer Rouge soldiers. Still, the Tribunal should proceed, thoroughly, objectively and quickly. Tuol Sleng reminded us of why. No one wants to have unpleasant things pushed into their lives, but you do have to face these things to let them go, and to move on. If you haven’t visited, then you should. It is a tough place to go, with meticulous photographs of the victims, with cells and torture equipment left in place, and it is all set in buildings which still look like a school, and situated in a very normal looking suburb of Phnom Penh. Normal, that is, if you ignore the barbed wire erected to stop both escapes and suicides, and the well kept graves in the school yard. By coincidence, the Museum had just dismantled its infamous “map of skulls”, but everything else was in place. The equally infamous Choeung Ek “Killing Fields” and its tower of skulls are a little way out of town. Many of the victims of Tuol Sleng were taken there, after being tortured into writing detailed confessions of their crimes, many totally fictitious. In our experience, visitors have two reactions. Either you really don’t want to visit again – many expat residents of Phnom Penh do not like adding Tuol Sleng to every escorted visitor’s sight seeing trip around town – or you want to learn something new each time, to try to place things into a clearer context, to try to understand. I’ve visited Holocaust sites and Museums in Europe and Israel – yet somehow Tuol Sleng hits me hardest. This time, I wanted to do a more detailed job of recording the place with my camera. Often, when I’m taking pictures, like many people I miss the real view – I am too busy with the technical details. I guess that is why I am not a great photographer. This time, it felt different. Of all my visits, this one I will remember most. Maybe it was because our children were with us. Forgive the moment of parental comment. Our children – 9, 12 and 14 – dealt with the visit maturely, with many questions, lots of silent thought, and a renewed desire to help. Ingrid and I reflected later that their reaction is exactly why museums like Tuol Sleng should be kept, to remind us all to be vigilant, and to remind us all to act.